The most beautiful gardens depend on planning a design that will not only compliment the surrounding landscape, but also reflect the seasons. An expert from Blooms Landcare can assist homeowners in choosing plants in shades of pastels for the spring, vivid hues of blooms in the summer, warm reds, yellow and orange to herald the cooler temperatures of fall and winter. A Fort Worth landscaper knows the conditions that plants in local gardens battle. Flowerbed maintenance needs include the proper moisture, protection from weeds and garden pests, and the proper nutrients. A good landscape design will be based on the availability of landscape maintenance as well as the appropriate plant for the right location. The amount of sunlight that the garden receives on a regular basis will be one of the top considerations for the choice of plants in the landscape installation. Less maintenance will be needed is flowering plants are chosen that are tolerant to heat, even if the garden gets full sun for most of the day. 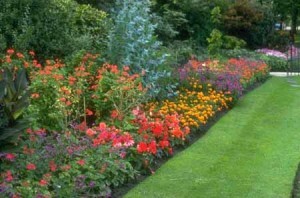 Annuals that love the sun come in all colors and heights, making them a good choice in the landscape design. Red blooms of the Pink Skullcap look a bit like snapdragon, and the foliage stays full if it is cut back occasionally. The plant grows to eight inches. A Texas native, Victoria blue Sage thrives in the Fort Worth landscape. The deep blue blooms of the 1 to 2 foot plant are striking. The Dwarf Mexican Petunia will grow in the full sun, or in a garden with partial afternoon shade. The plant has dark green foliage and large lavender flowers. A garden designed with the help of the landscaping team at Blooms Landcare will give you the private landscape that you have always dreamed of having.Contact Us Or Call (817) 688-5352 for advice from the experts, and build a garden to add beauty to the home and offer a beautiful area for relaxation.